From valley floor to mountain peak, our canyons span a range of natural habitats as diverse as the deserts of Mexico and the forests of Alaska. Also called ecosystems or biomes, these micro-environments are rich in flora and fauna adapted to the particular temperature, moisture and elevation of each area. Plants and animals within each biome depend on each other in complex ways which we have only begun to understand. For example, many animals depend on plants for food. Those plants often depend on the very same animals for pollination. The loss of a single species can destroy the whole community. 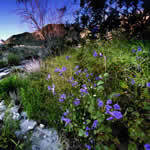 Imagine Chino Canyon as a world class ecotourism destination, with much of the land preserved as parks and open space. As a destination for hiking and biking, visitors can experience this unique ecological diversity via cultural and interpretive learning centers. Ecologically sensitive lodging and other appropriate visitor amenities will enrich the entire Canyon experience. Stretching from the valley floor to the area above the Valley Station of the Palm Springs Aerial Tramway, lies the Sonoran Desert zone. Visually dominated by Creosote Bush and brittlebush, this area also includes sycamore, cottonwood, elder and black maple on the canyon floor, and wild apricot, burrow brush, lavender and yucca on the hillsides. The gently undulating slopes of the canyon floor are curently threatened by mass grading and terracing. 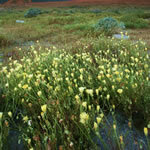 Once disturbed, this delicate ecosystem has little chance of recovery. 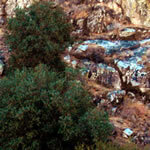 In the lower part of the canyon, south of the Tram Road, lies a 'cienega', the Spanish word for 'marsh'. Underground water provides a fertile environment for cottonwood, sycamore and mesquite as well as the native California Fan Palm that gives Palm Springs it's name. Smaller plants include barrel cactus, cholla and prickly pear, yucca and many wildflowers. This relatively moist and shady environment provides food and shelter not only to raccoons and coyotes, but to bobcats, gray and kit foxes and Desert Bighorn Sheep. Above 4,000 feet, the canyon begins to narrow dramatically. Plants from the Sonoran zone mingle with scrub oak, mountain mahogany, manzanita, wild lilacs and junipers. Ferns find shady nooks, with areas of Chapparal in the flats. Bighorn sheep, foxes and bobcats are joined by deer and Mountain Lions. Temperatures drop as elevation increases in this area which frequently sees winter snowfall. As the canyon reaches its apex at the Tram Mountain Station, the landscape becomes blanketed in coniferous forest. Pinyon pine, yellow pine and big cone pine mix with white fir, juniper and chinquapin. Lupins and poppies bloom in the understory. The stark granite core of Mount San Jacinto itself dominates the view as every surface seems to become vertical. All photos credit: Tom Brewster Photography unless otherwise specified. Transitional zone photos courtesy of Palm Springs Aerial Tramway. 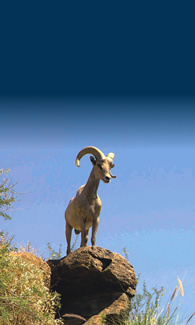 Bighorn photo courtesy of Bighorn Institute.